Sea salt producers work on clearing mud from salt fields in Lombok, Indonesia. Traditional sea salt production has been practiced on the island of Lombok in Indonesia’s West Nusa Tenggara province for generations. It is labor-intensive work generally done by poor women like Mini Asmayanti. Mini earns less than $2 a day. This modest income, along with that of her husband, a fisherman, provides for them and their two sons, but it is negatively impacted by seasonal factors. Reliance on the sun to dry the salt, for example, means that salt production is limited to summer and fall. 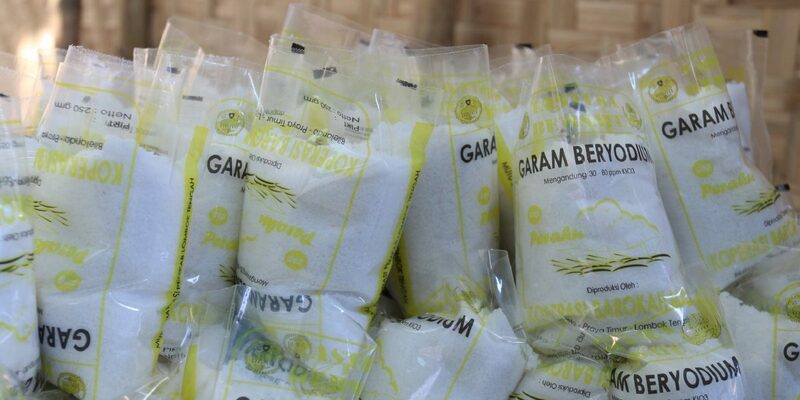 As part of MCC’s Indonesia Compact, the Lombok-based non-governmental organization Panca Karsa is working with salt producers to increase the quantity and quality of salt production to boost incomes and sustainability of production. Panca Karsa helped form three salt cooperatives spanning six villages that are empowering 438 poor women like Mini, who used to work by herself with little skills or support. Mini Asmayanti stands between shallow ponds known as salterns from which salt is extracted in Lombok, Indonesia. MCC investments in Indonesia are introducing sea salt producers like Mini to everything from new labor-reducing, energy-efficient technologies to financial management and marketing training to boost production and incomes. Today, Mini and other cooperative members are benefiting from labor-reducing and energy-efficient technologies as well as training programs aimed at improving salt-making skills, financial management, business planning, and quality control, packaging and marketing of salt. The program also includes monthly meetings in the community to raise awareness of maternal and child health and nutrition, access to health and other services, and improved gender relations by task-sharing between men and women within households. MCC’s investments in Indonesia and other partner countries support the goals of Feed the Future by helping to empower women farmers and entrepreneurs and implement market-driven solutions to poverty and food insecurity. Salt is traditionally extracted from seawater poured into shallow ponds known as salterns. Lombok’s salt producers previously spent their days carrying the water by hand from the sea, clearing mud from salt fields, and drying and hardening the soil to make sure that it doesn’t mix with the salt. The success of the salt-making process relies on the availability of briny water and the heat of the sun to achieve evaporation, concentration and crystallization. Once salt is collected in ponds, the farmers harvest it, wash it in clean water to remove the mud, and then boil it to produce pure clean salt. They used to carry the salt on their heads from the ponds and boil it in open, smoky stoves. As the farmers did not have the necessary skills and technology, they used to produce lower-quality, lower-priced salt to sell in bulk at local markets or in exchange for rice and other staples. MCC’s investments are helping to reduce workloads and improve efficiency for salt producers like Mini through introduction of piping of seawater to salt ponds and improved filtering techniques. The investments also helped the sea salt producers acquire wheelbarrows for bringing salt from the salt ponds to production houses. “Before, I was working as a salt farmer, but I did not have the skills, technology and equipment that could increase my production while reducing my workload,” said Mini. Today, instead of one to two bags of salt (up to 176 pounds), she produces 10 bags of salt per field. Overall, as reported by Panca Karsa, salt yields have tripled (from 25 tons per hectare to 77 tons) and price for crystallized salt has doubled due to improved quality. A salt producer drains harvested salt in Lombok, Indonesia. Salt-making is a labor-intensive process that relies on the availability of briny water and the heat of the sun to achieve evaporation, concentration and crystallization. 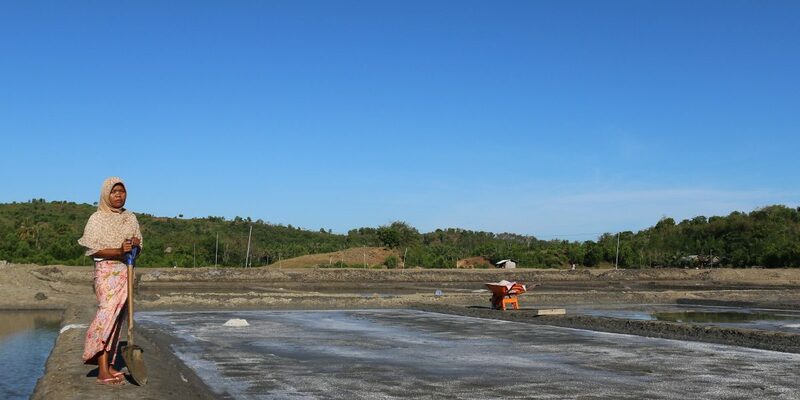 MCC’s investments are helping to introduce technologies that are enabling Lombok’s sea salt producers to make higher-quality, higher-priced salt year around. Panca Karsa is working with cooperatives to provide salt producers greater bargaining power, economies of scale, diversification and open new markets. The cooperatives are tapping into increased demand for the region’s sea salt by chefs and health-conscious households who value trace minerals such as magnesium, calcium and potassium. Business networking workshops are helping to bring stakeholders together to improve packaging, labeling and marketing to make the salt more competitive in artisanal and niche markets. The price between the salt sold in bulk versus salt that is packaged in bags, bottles or boxes can be six times and more the price. Moreover, the cooperatives are helping increase the availability of iodized salt in West Nusa Tenggara province, which is supporting the Government of Indonesia’s efforts to reduce iodine deficiency. The MCC-funded project has helped improve bargaining power of the sharecropper salt producers with the landowners. During a recent visit to Lombok, some of the producers told me that they now retain 60 percent of the production versus the previous 50 percent. This greater sense of ownership among salt producers is incentivizing them to invest more time and resources to expand production. There has been a revival of a local tradition of shared labor and cooperation, known as besiru among the salt producers. Impressed by the growth of goodwill and productivity among salt producers, several local landowners donated land for the period of 25 years to establish two salt production houses with 22 energy-efficient stoves. “We are happy to voluntarily share our land, so women salt producers can utilize improved stoves that will increase salt production. We believe that this will provide benefits for our community overall,” said Amag Juni, one of the landowners. To increase the supply of readily available fuel for future processing needs, the project supported the planting of thousands of fast-growing trees on degraded local land. With the energy-efficient stoves in place, salt producers will be less constrained by lack of sunlight during the monsoon season and able to make high-quality salt year-round. 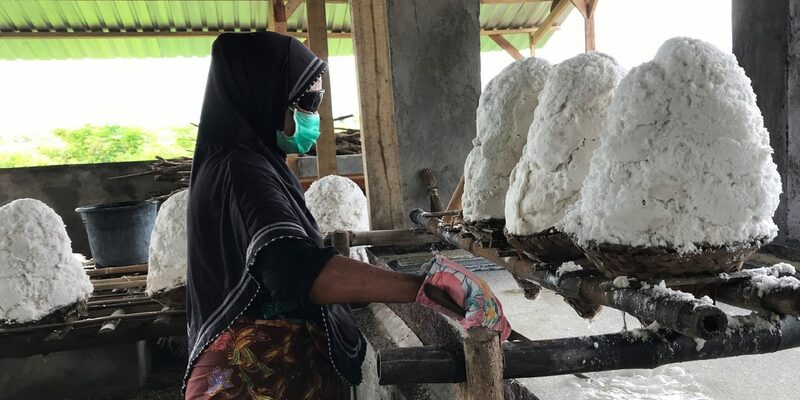 As part of MCC’s Indonesia Compact, cooperatives in Lombok, Indonesia, are working with women sea salt producers to bring packaged, iodized salt to local markets. This not only fetches a higher price than salt sold in bulk but also supports the Government of Indonesia’s efforts to reduce iodine deficiency. Today, Lombok’s salt producers are better able to provide for their families and invest in their financial future. “I am allocating a portion of my income to lease another plot to increase salt production. In the long term, I hope to expand, so I can increase my family’s income,” Mini said. The cooperatives have established group savings and loan facilities to sustain their work long after MCC’s compact ends to build on the project’s improvements in equipment purchase, maintenance and repair, technology, salt production and marketing. During project implementation, the district government declared Lombok an Artisanal Salt-Making Area and committed funds for improved quantity and quality of salt production. Further investments in value-added packaging, new product development and expansion to new markets would open even more opportunities for the women sea salt producers of Lombok to increase their incomes. By working with its partner countries to empower women farmers and entrepreneurs, MCC is helping to bolster rural economies and support U.S. Government’s efforts to strengthen global food security. About the Author: Nilufar Ahmad serves as Director for Gender and Social Inclusion at the Millennium Challenge Corporation (MCC).